Regular checkups are vital to the health of your teeth and gums. 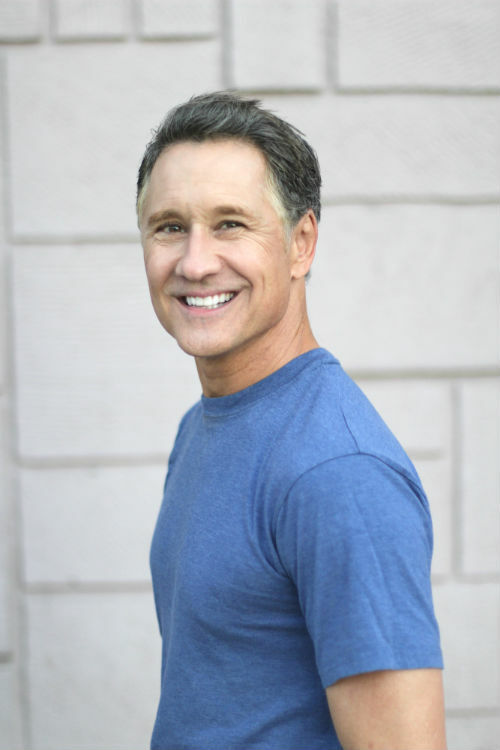 Dr. Mc Clure and staff provide gentle, yet effective dental care to patients of all ages. 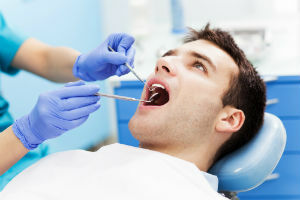 A dental exam may include x-rays and an examination of the teeth, gums, and bite. During a dental exam the patient will find out if there are any underlying problems and can ask questions about any pain or discomfort he or she may be feeling. 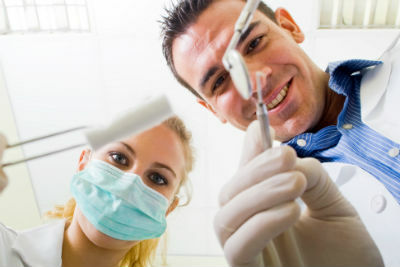 A thorough cleaning is often part of a dental exam as well. 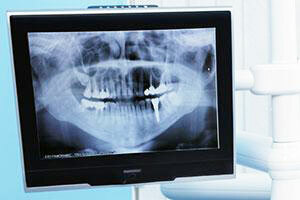 Dental x-rays are typically taken during a regular dental exam, or as needed for emergency situations. X-rays are usually taken of the front and sides of the mouth and then reviewed by the dentist to see how the teeth are forming and whether or not there are any cavities or areas where bacteria are getting into the teeth. A panoramic dental x-ray may be taken to get the entire view of the mouth including the wisdom teeth. White fillings, also known as composite resin fillings, are usually used for filling cavities or for bonding the front teeth. White fillings have come a long way in terms of aesthetics and comfort. During this dental procedure the dentist will remove the infected part of the tooth and fill it with the white, composite resin. An ultraviolet light is then used to harden each layer until the filling resembles a real tooth. New white fillings usually need to be replaced every 7 to 10 years. It is important to visit your dentist and get a regular teeth cleaning at least once every six months. This process includes a general checkup of the teeth, jaw and gums to make sure everything is healthy. Your dentist will also check to see if there is any tarter buildup, cavities, or evidence of gum disease. A dental hygienist may performing the teeth cleaning with involves removing plaque and polishing your teeth until they shine. Getting your teeth cleaning regularly is one of the most important things you can do to ensure a happy, healthy smile for years to come. A dental bridge is used to bridge the gap when a tooth is missing. The bridge is usually covered with a dental crown that looks like a regular tooth. It usually takes two separate visits to get a permanent bridge. During the first appoint the dentist will take an impression so that an exact mold of your teeth can be created. 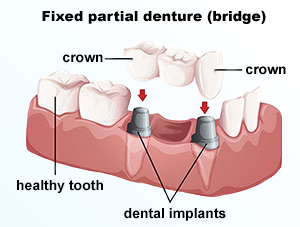 You will then receive a temporary bridge that will hold your teeth in place until the permanent bridge is ready. A bridge can last more than 10 years with proper dental hygiene. 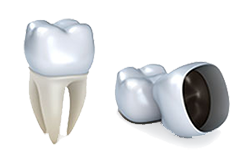 Dental crowns are placed over a rebuilt tooth to resemble a real tooth. They are usually used to protect a tooth from further tooth decay, to restore a broken tooth, to cover a root canal, or even to cover discolored teeth. Porcelain is preferable to metal crowns that are more noticeable, although porcelain usually costs a bit more. The technology for dental crowns has improved significantly over the years. Getting fitted with a crown usually takes at least two trips to the dentist because first a mold is made, then it is sent to an off-site laboratory to be custom-made. However, some offices have CEREC machines that can produce crowns the same day. Dentures completely replace teeth lost to decay or accidents. Complete dentures are used when all of the teeth are missing. If only some of the teeth are missing your dentist will recommend partial dentures. Before being fitted with dentures, all of the teeth must be completely removed and the gums must heal. Immediate dentures may be a possibility if you don’t want to wait for the healing process. Dentures must be cared for and maintained, just like natural teeth. And just like any other dental appliance, it may take a little while to get used to them. They can temporarily affect the way you talk while you’re adjusting. Once you get used to them though, dentures will look and function just like natural teeth. Gum disease can be quite serious, but gums don’t always get the attention they deserve. To prevent gum disease it is important to brush and floss regularly, and of course get regular dental cleanings. If plaque, a sticky film filled with bacteria, forms on your teeth it can infect your gums and cause periodontal disease. Gum disease treatment includes pocket reduction procedures, soft tissue grafts, and crown lengthening. The first step, however, is scaling and root planning (SRP). During this procedure the dentist will remove plaque and tartar from the root surfaces underneath the gums. A local anesthetic is used during this procedure.